USC basketball coach Andy Enfield has recruited quite a few talented players to play at the Galen Center, but his current floor general wasn’t one of them. Julian Jacobs is one of the last reminders of the Kevin O’Neill era. Enfield, however, has molded Jacobs into one of the key pieces in his up-tempo offense. The 6-foot-4 point guard from Las Vegas provided a spark immediately in his freshman year, and got his first career start in the second game of the season. His energy and athleticism were the traits you noticed right off the bat. He also impacted the game in many different ways. Out of all Pac-12 freshmen last year, Jacobs was 11th in scoring, tied for fifth in rebounding, second in assists, second in steals and fourth in blocks. After a slow start in non-conference play this season, Jacobs has stepped up his game against USC’s Pac-12 foes. He has elevated his game even more when freshman point guard Jordan McLaughlin has been sidelined with injuries. After McLaughlin got sidelined against Oregon in mid-February because of his left shoulder, Jacobs has been the focal point of the team. In his last six contests, Jacobs has averaged 12.5 points, seven rebounds and 7.2 assists per game. On the defensive side over that span, he’s averaging 1.5 steals and 0.7 blocks per game. Nothing exemplified his play more than last game against Oregon State. 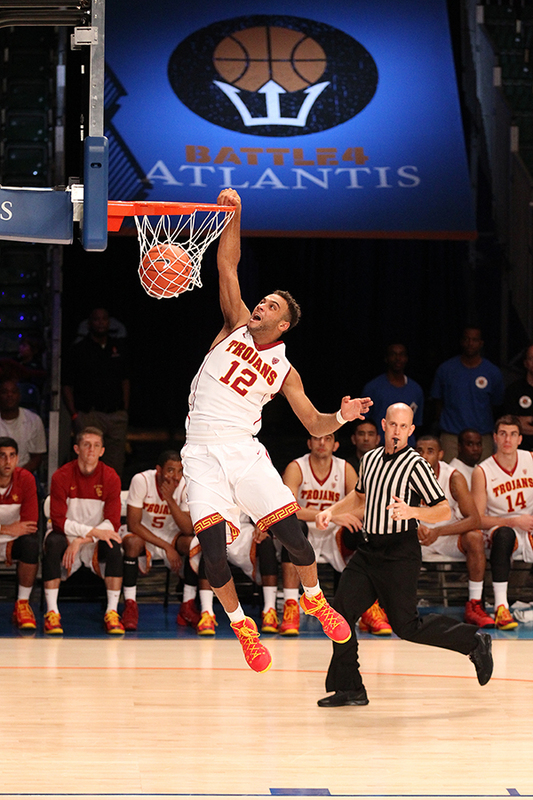 Jacobs had eight points, 10 rebounds and nine assists. He also only had two turnovers. Turnovers have plagued Jacobs in the past. In his last four games though, he has 30 assists versus nine turnovers. Most importantly, USC won two of the games over that stretch, after only winning one of the first 11 conference games. Just like his freshman season, Jacobs has the potential to make an impact on any play. But this time, he’s been given the opportunity to do so in an expanded role. His relentless energy and competitive nature has rubbed off on his teammates as well. Last season, USC’s average margin in Pac-12 play during the regular season was being outscored by 11.5 points. This year, it’s dropped to seven points. That includes seven losses by five points or fewer. Another big change this season for Jacobs won’t appear in any box score: he was named one of the two captains on the team before the season. USC is the fourth-youngest team in the country this season. Even though he’s only a sophomore, he’s had to become the veteran and the glue guy over the course of the campaign. Now Jacobs has one more thing left on the checklist for the regular season: beating UCLA. There are 11 players on the roster that have never beaten the Bruins. Jacobs is one of them. 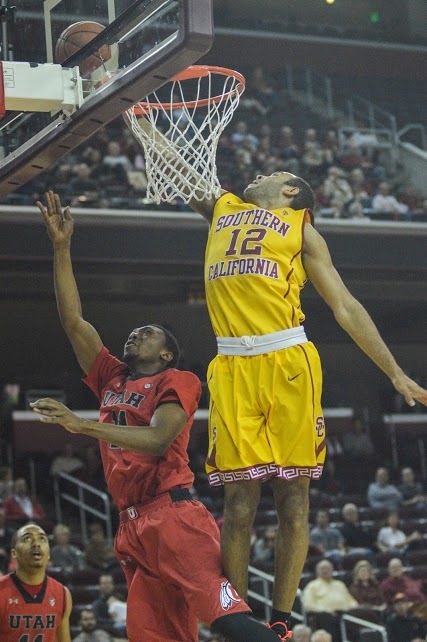 In his three career games against UCLA, Jacobs and the Trojans have lost by an average of 20.3 points. The closest defeat was by 10 points at Galen Center last season. This time around, the game at Pauley Pavilion on Wednesday night will be a big test for how Jacobs and the young Trojans have progressed this season.